Home/From Why to What to How – what’s your purpose? From Why to What to How – what’s your purpose? One of the enduring factors in creating an agile and innovative business is purpose. Purpose answers the question: why do we do what we do? It gives a sense of determination to your ambition and direction. It gives a different flavour to your work then a vision, mission or strategy. To me a vision provides a point on the horizon, the guiding light for your ambition. A mission directs the task that will lead you to your vision. And a strategy is a process or road map to realize your vision. Jim Stengel, ex-CMO of Procter & Gamble, postulated in his book Grow (2011) that there is a very sound economic argument for a focus on purpose. A ten-year study of the growth of 50,000 brands shows that companies with ideals to improve people’s lives at the center of all they do outperform the market by a huge margin. The world’s fastest growing brands are organized around ideals. The top 25 like Apple, Red Bull, Google and Starbucks – excel at clarity, consistency, commitment and creativity. 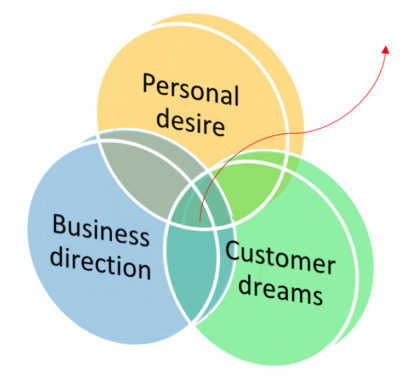 So, how do you, as a business find your purpose? 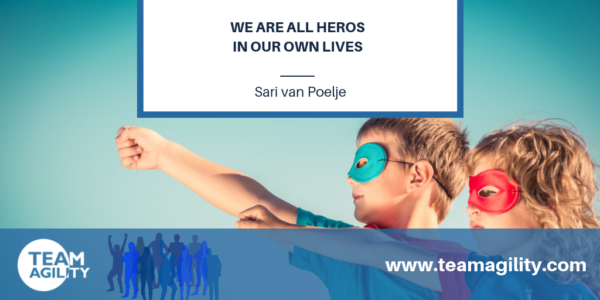 We’re going to look at how we can use the idea of the Hero’s Journey to consider our business purpose and how we can write the business story that serves our personal desires, our customer’s dreams and the business direction. Let’s first consider personal desire. Humans are not just the sum of our experience or even our relationships. We are ultimately the sum of our stories. It is not the events in our lives that determine our actions, but the interpretation of those events. For example, I could describe my expat childhood in very different ways. I could tell you a story of a nomadic existence, with a subsequent lack of belonging or feeling of home. Or I could tell you a story of the rich cultural experiences we had and the opportunity to build friendships all over the world. Of course both stories could be true. But the important thing is: depending on the story I choose, my experience of life will differ. Narrative theories, like J. Campbell’s “The hero with a thousand faces” (1947) and Berne’s Transactional Analysis, can help frame this idea. Within TA we believe that people create a life script at a very early age, a story about who we will be when they grow up. This story informs our actions like a kind of bass tone in our lives, and determines many of the main themes that run through our personal, relational and professional lives. Formally we define a life script as follows: A script is an unconscious life plan learned in early childhood, reinforced by parents and reinforced by later events, resulting in a known pay-off. The same holds true for organizations. At the cultural level, it is the script beliefs of founders, reinterpreted by successive generations of company leaders, that influence the culture in a company. Your leadership, what you have learnt through it, how you write the story of your learning, in part determines the purpose of your organisation. You have probably already completed the RATE exercise from a few months ago. Things will have changed in the intervening months. It’s important to regularly review what you have learnt, so go ahead and revise your answers to the questions from What are the key learning moments in your leadership?